Although I don’t usually cover Aspley Guise, I thought this peice was so interesting, it was worth reproducing here. This article, by Katharine Bunner, originally appeared in Gustav Stickley’s American magazine, “The Craftsman – an Illustrated Monthly Magazine in the Interest of Better Art, Better Work, and a Better and More Reasonable Way of Living”, sometime between October 1909 and March 1910. There were two illustration, repoduced below, and I have included a couple of local lacemakers postcards by local photographer Robert Cheetham too. Everywhere in Great Britain and Ireland one finds attempts being made to plant or to re-establish home and village industries. Some are successful from a practical point of view; others are not. Each one, however, is an effort in the right direction and helps to establish an attitude toward handicrafts that finally must result in better social and industrial conditions. But the real interest lies in the discovery in England of a village industry that, unlike most of the crafts, has never needed reviving, because for centuries it has been carried on by the people as a means of livelihood; a hereditary handicraft that has descended from mother to daughter, and that is practiced more or less as a side issue, occupying the time that can be spared from the work of the farm or the household. 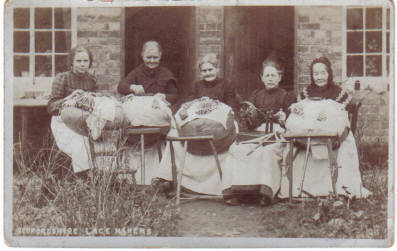 This industry is the making of lace in Bedfordshire. It is said that the craft was first introduced in the shire by Catherine of Aragon, and the fact that most of the patterns are reminiscent of Maltese lace seems to confirm the general belief. Whether or not it is true that the luckless Queen of Henry VIII found employment for some of the spare hours of her troubled life in teaching the art of lace- making to the peasants in certain portions of her adopted country, it is at all events certain that the people of Bedfordshire learned much about lace-making from the French refugees who came over to England in large numbers some generations later, and who were forced to eke out a living as best they might by putting to practical use such of the French crafts as they happened to know, for traces of this French influence, as well as of the Spanish, are plainly discernible in the Bedfordshire lace. Some of the most interesting of these laces are made in the little village of Aspley Guise, which lies just outside the gates of the great park surrounding Woburn Abbey, a country seat of the Duke of Bedford. Aspley Guise is little more than a hamlet, – just a handful of quaint old thatched cottages in a more or less doubtful state of repair, but each one nestles in a garden such as grows only in England; a genuine kitchen-garden, where flowers, berries and vegetables grow sociably and closely together, each inch of ground yielding its all. In these later years, the centre of the village life is the thriving little Agricultural School established not long ago. This is a place where the farm lads and lasses of the country around may learn the best and most modern methods of farming, dairying, poultry raising, bee-keeping and cookery. The lace-making is rather scorned by the rising generation, although here and there some daughter or granddaughter takes sufficient pains to learn the ancient craft of the village; spurred to it perhaps by the praise given by visitors to the exquisite laces that grow into being on the big round pillow that is the special property of the old grandmother, and by their admiration of the wonderful dexterity with which the quaint carved bobbins are handled by the aged fingers, – for in the village of Aspley Guise it is the old grandmother in each household who makes the lace. If the family happens to be fairly well off, she makes it to occupy the time that hangs somewhat heavily on her hands, but if times are hard, and the howl of the wolf at the door is sometimes heard too plainly, then the grandmother’s withered fingers fly swiftly among the bobbins for long hours every day, and the few pence gained by the sale of a yard or two of lace help to buy food and to keep the roof over their heads. 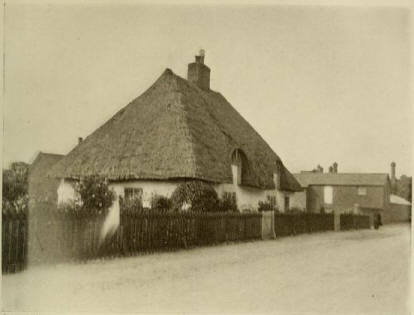 A cottage lived in by one of the lace makers at Aspley Guise, Bedfordshire, England, and typical of the homes of these interesting and simple people. The first of the lace-makers we visited the day I went to Aspley Guise, was Mrs. Williamson, for many years a charwoman at Woburn Abbey, and now living on a small pension. As her husband is living and she has a thrifty family of sons and daughters to help her, her lace is usually not for sale. She makes it for her daughters and her daughters-in-law and for all the sisters, cousins and aunts that belong to every well-regulated English family, with the result that these plain farmer folk own a store of laces that would be worth a small fortune in New York. Mrs. Williamson is a hearty old dame who enjoys seeing visitors, and as she works she will tell you how she was sent to a lace school when she was a wee mite of five. In the old days girl children were put to the lace-making very young, partly to keep them out of mischief and partly because they gained a dexterity of hand and eye that was considered impossible when the craft was learned later in life. Nowadays, even in the country villages in England, child labour is illegal, but Mrs. Williamson stoutly declares that she was never the worse for the work she did then, and that the girls of today would be better off if they were made to do something useful instead of fiddling away their time. The teacher was strict and, whether the pupil were apt or not, a certain amount of lace had to be made each day. If the tale were not complete at the close of the day, the luckless little worker had to stay until it was finished. Therefore the task meant constant attention and quick work, – which must at the same time be most careful and accurate, because a mistake meant ravelling out the faulty piece and doing it over again, and ravelling took two or three times as long as the making. When she married, Mrs. Williamson dropped her lace-making because the care of her house and children and her duties at the Abbey took all her time, but in later years when the heavy work was perforce given over to be done by younger and stronger hands, she turned again to her lace pillow. Her old art came back to her as if it had been a thing of yesterday, – and when she tells you of this the musical clash of the bobbins grows a little quicker and there is a ring of pride in the pleasant English voice that forms a running accompaniment to her work. Then the lace pillow is pushed aside and a box is brought out, from which roll after roll of blue paper is taken and a wealth of lovely laces are spread out over the table for the visitor to admire, but by no means to buy, for they are all gifts to the daughter who has stayed at home with her mother, and who has been moving about quietly and busily all the time the mother worked and chatted. There was in the collection one or two pieces of old Bedfordshire point, the making of which is almost a lost art now, for it is the most difficult and tedious of all and brings but a fraction more money than the cobwebby patterns which go so much more swiftly. 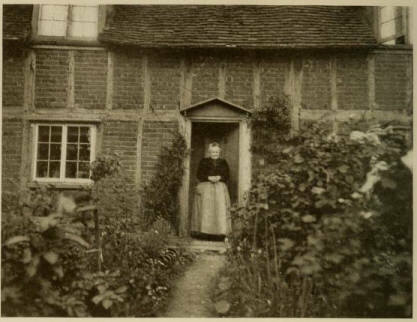 But there were other workers to be visited, so we strolled down the one street of the village to see Mrs. Taylor, whose tiny cottage dates from the days when the oaken beams of the framework were all revealed on the outside, slightly sunk below the surface of the thick rough plaster walls. Mrs. Taylor is a widow, and lace-making with her is no recreation for spare hours, but a very real necessity. Most of her living must come from her little garden and from the lace she is able to make and sell; so in this case there was no question of vainly longing to possess some of it, for here we could buy. The beautiful piece she had on her pillow, an edging more than two inches wide, was promised to someone else, but she agreed gladly to duplicate it for me at a shilling a yard as soon as she had finished the order for three yards which was then making. But she had a piece of insertion that was nine-pence a yard, and we lost no time in coming to terms over that, although, recollecting the price I would have paid for it in New York, I had to fight hard against an impulse to offer the sweet-faced old woman three or four times the modest sum she asked. At the foot of Mrs. Taylor’s trim little garden we entered another cottage, and here was a case of still greater need for all that could be gained from the time-honoured craft of the village, for Mrs. Wood was seventy and badly crippled with rheumatism, – so badly that she could only sit at her pillow plying the bobbins with her stiff fingers and making lace to pay not only for food and shelter, but the small wage that must be given each month to the neighbour’s daughter who came in to do the necessary housework. Mrs. Wood’s husband sometimes earns as much as ten shillings a week, but it is whispered that not all of that wage goes toward the housekeeping, and that the greater part of the burden too often rests upon the crippled hands that yet have the power to make laces like fine frost-work. In this house there were several pieces of lace for sale and the luck that brought a purchaser to her door was even more remarkable to; Mrs. Wood than to her neighbour, Mrs, Taylor. The narrow laces cost four pence- halfpenny a yard, for, as she apologetically explained, there was nearly as much work in them as in the wider pieces that would bring seven pence, nine pence or even a shilling. For an elaborate piece so wide that it would have made a very respectable flounce, the sum of three shillings a yard had to be asked, but that was so expensive that there were very few orders for it. With the exception of some old woman here and there who has only her lace pillow between her and the workhouse and clings to it with the fierce independence of the English peasant, hoping that her power to work may not be taken away from her until she is laid in her coffin, the industry is practiced merely as a side issue to gain a little extra money or to enable the worker to make for her friends and kindred presents which she could not afford to buy. 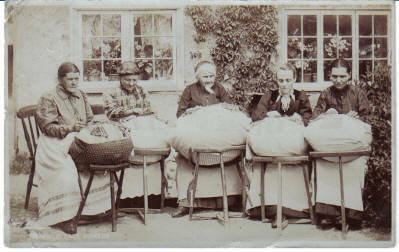 The living of the people is gained from the farms, the poultry, the garden and the bees, so lace-making cannot be said to form an important asset from the commercial point of view, but as a home industry, carried on during the leisure hours, it is so well worth while that philanthropists who wish to establish some such form of work in this or that rural community would do well to go and see the quaint old women who make lace under the thatched roofs of Aspley Guise, and to learn from them something of the pride and pleasure which comes from the turning of an honest penny here and there by the making of a beautiful thing.